The annual Shakambari Festival held at the world famous Vijayawada Kanaka Durga Temple in Ashada month will begin on July 14, 2019. During the three-day annual festival, Goddess Durga takes the form of Mother Shakambari - she is adorned with green leaves and vegetables. In 2019, the Shakambari festival is from July 14 to July 16. It is observed from Ashada Shukla Paksha Trayodasi to Purnima. Goddess Shakambari Devi is an incarnation of Goddess Shakti and is worshipped in many parts of India. It is believed that she feeds those who are hungry with vegetarian food. She is Mother Earth who suffices hunger. Shakambari Ma is known as ‘the bearer of the greens’ – Shaka means vegetables and Amabari means who bears. Goddess Shakambari is mentioned in the Devi Mahatmya. The annual festival in Ashada month is celebrated to propitiate the Goddess for abundant rains, good harvest and for the plentiful yield of vegetables. Rituals like ‘Chandi Homam’ and ‘Veda Pathanam’ (Recitation of vedas) are observed during the three-day festival. It is estimated that more than nearly 150,000 people will visit the Vijayawada Kanaka Durga Temple during the Shakambari festival. In the Devi Mahatmya, it is said that Goddess Durga appeared as Shakambari after a dry period of hundred years. 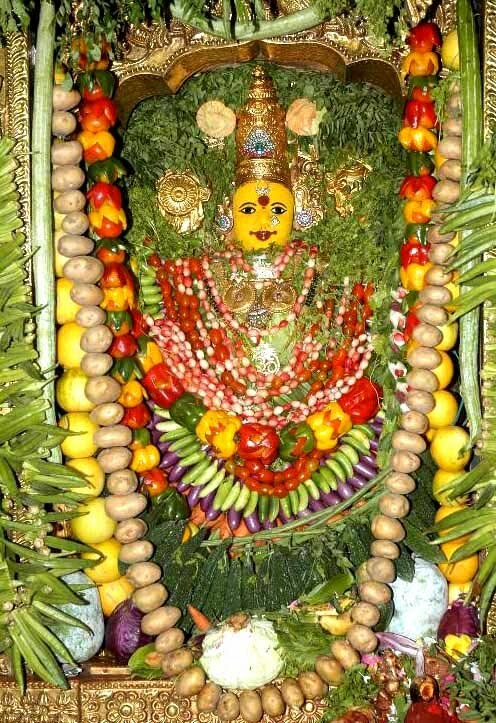 She brought forth from her body fruits, flowers, vegetables and herbs to suffice the hunger of the people.